A conical gradient is created by first specifying the center of a gradient-circle and then several colors placed along its circumference. The image is constructed by creating an infinite canvas and painting it with rays rotated around a fixed endpoint which is anchored at the center of the gradient-circle. The color of the painted ray is the color of the gradient-circle where the two intersect. This produces a smooth fade from each color to the next, progressing clockwise. With color selections that significantly differ in lightness, the visual result is reminiscent of a cone observed from above, hence the name "conical gradients". The first argument to the function determines the center of the gradient. The <position> notation is defined by the positioning syntax of ‘background-position’ and is resolved in the same way, using the center-point as the subject and the content box as the positioning area. [CSS21] [CSS3BG] If this argument is omitted, it defaults to ‘center’. Note that the CR of CSS3 B&B doesn't yet have a definition of <position> - it's defined in the ED, and an update to B&B is expected. Color stops are placed across the circumference of a gradient-circle whose center is anchored at the center of the gradient. Its exact radius is not relevant, since every positive radius produces the same results. In other words, there is an infinite number of suitable gradient-circles. 0deg points upwards, 90deg points toward the right, and positive angles go clockwise. Percentages can also be used and they correspond to fractions of 1turn. Locations before 0% (0deg) and after 100% (360deg) can be specified; though out-of-range locations are never directly consulted for rendering, they can affect the color of in-range locations on the gradient-circle through interpolation. For example, conical-gradient(white, black 125%) will produce the same result as conical-gradient(white, #333). Are there enough use cases to warrant the complexity involved in generalizing gradient-circle into a gradient-ellipse? Should we allow the 0deg point to be customized? 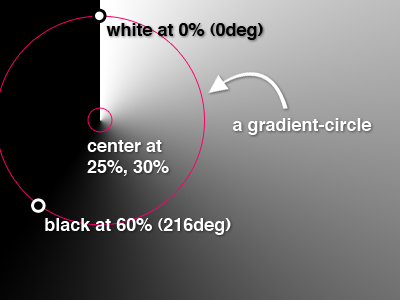 This example illustrates visually how to calculate the placement of color stops on the gradient-circle, as well as the gradient produced with ‘background: conical-gradient(25% 30%, white, black 60%);’ as a background on a box that is 400px wide and 300px tall. 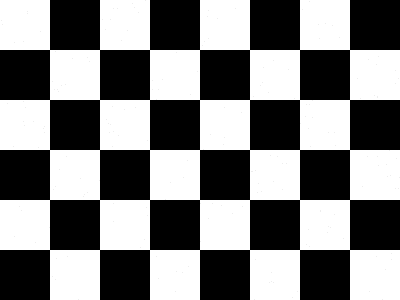 All of the following ‘conical-gradient()’ examples are presumed to be backgrounds applied to a box that is 200px wide and 100px tall. <color-stop-circular> = <color> [ <percentage> | <angle> ]? What should be here and what in 4.3.2? Circular color stops are very similar to the linear color stops defined above. However, unlike <color-stop>, circular color stops are placed along the circumference a gradient-circle, which can be thought of as a circular gradient-line. Angles are measured clockwise, starting from the topmost point in the gradient-circle. Percentages refer to fractions of 1turn. Circular color stops are usually placed between 0 and 360 degrees, but that's not required; a color stop can be placed at any angle and still affects the gradient through interpolation.